This coming week, October 21-23, we’ll be in Washington DC at the Emetrics Marketing Optimization Summit. If you’ll be there, stop by for a ClickEquations demo, let us answer any questions you might have, or get setup for a free trial. The exhibition hall is open Tues and Weds. 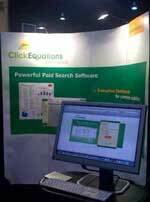 To schedule a private discussion or demo time, just contact us at info@clickequations.com.